Ashton Walker, contract employee on a new water treatment plant here, welds on the plant’s clarifying tanks, Feb. 10. The $100-million water treatment plant will recycle/reuse nearly all of the water used and replace the dual water system here. With warmer weather and longer days, you’ll see more of them – in their optical green and orange safety vests and hardhats, working on the other side of construction cones, barriers and fences. 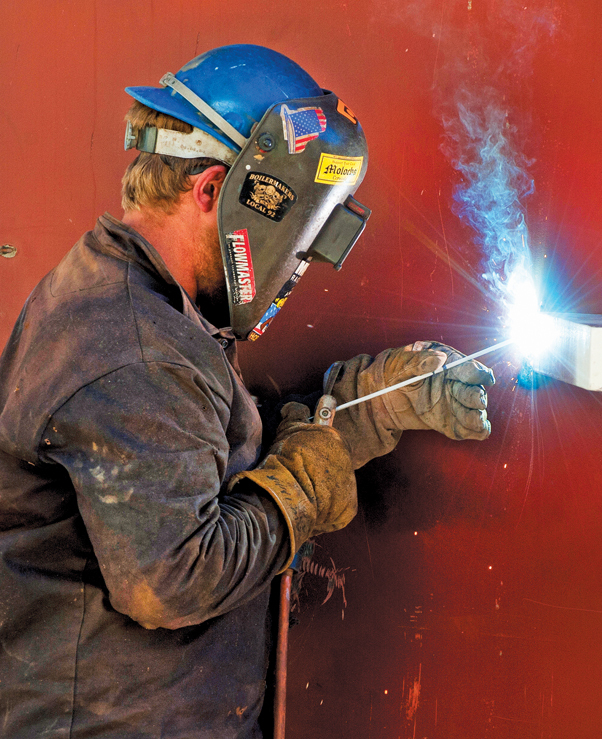 They are part of a changing workforce of about 5,500 contractor and subcontractor personnel who may work here for a day, to several weeks or months, now that the construction season is in full swing. “We have several storm damage recovery projects going on right now,” said Muhammad Bari, head of the Directorate of Public Works here. While flood damage repair work started soon after the August 2013 flooding, the work now is mostly about permanently repairing, restoring, and in some cases also improving Fort Irwin facilities and infrastructure, paid for by $80 million Army emergency funding the past two fiscal years. Bari noted that Fort Irwin’s previous flood control plan was designed to handle 25 to 50-year storms. Work today includes restoring existing channels and putting in rip rap (large boulders strategically placed to break up masses of fast-flowing water in flood channels), as well as restoring concrete dikes and berms. The revised flood control plan calls for re-establishing the flood channels around Outer Loop Road and Inner Loop Road, so they can better handle water rushing down from the hills behind the housing areas. The Fort Irwin cantonment area is like a giant bowl tilting northwest to southeast, explained Bari. Bari estimated it would probably take more than $100 million to implement the revised flood control plan. 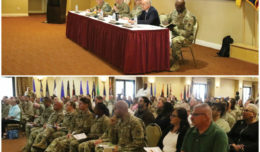 Rather than waiting in line with other Army installations to secure funding, the garrison is working with other Army, Army Reserve and National Guard units to incorporate Fort Irwin in their training plans. One initiative is to bring United States Military Academy engineering students to work with DPW senior engineers during the summer, to prepare blueprints for various water surge channeling and containment projects. The DPW is also working with National Training Center’s operations staff to line up various National Guard and Army Reserve engineer units to train here in succession, to complete flood control projects during summer months. Work also ongoing for Fort Irwin’s two major military construction projects: the $175 million replacement hospital on Inner Loop Road past 5th Street, and the new $100 million potable water treatment plant on Goldstone, west of Outer Loop Road. 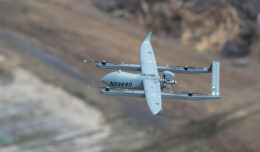 Right now, the work most apparent to the Fort Irwin community is the tearing up of roads and roadsides, where water, communication, and power lines are being built and connected to existing and new on-post utility sources. Most of this infrastructure work should be completed late this year or by middle of next year, Bari said. 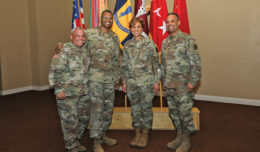 This is in addition to Fort Irwin’s annual $10-15 million capital improvements program projects to replace aging infrastructure, such as sewer, water and power lines, as well as streets and facilities. As part of this work, Fort Irwin’s electrical power infrastructure provider, Southern California Edison will be tying into Fort Irwin’s power grid, two new home-grown major sources of power: a $6 million-solar-power project being built near Fort Irwin’s recreational vehicle park on Goldstone Road, and a waste to energy steam generation plant, that is part of $34 million Energy Saving Performance Contract project at the Fort Irwin Landfill on Sanitary Fill Road. Distance is a major challenge for Fort Irwin. Contractors must bring personnel from Barstow (almost an hour away), the Victorville/Apple Valley area (about one-and-half hours away), or from beyond over the San Bernardino Mountains – two or more hours away. The DPW staff meets regularly with contractors of ongoing projects, to determine if they can schedule projects on the same road at the same time. “We are working with CDM Smith on their water capital improvement projects, and with Southern California Edison, our electrical power provider, and CH2MHill, our sewage operator,” Bari said. “If one of them has to lay down a pipe or install a conduit on the same road, we try to get them to do their projects at the same time, so we don’t have multiple closures of the same road.